Oh. Hi. How are you? It’s been awhile since I’ve seen you. I was starting to take it personally, like you didn’t like me that way or something. Totally awkward. What? It was me that’s been gone? What. Ever. Anyway, guess what? Wrong. Wrong. Wrong. Wow, you are really bad at guessing. What you should’ve guessed was “I’ll bet Jeff has two pieces of news so exciting that it’s going to make me squeal with delight!! !” Because then you would’ve been CORRECT. Deuce Winters is a stay at home dad in the small town of Rose Petal, Texas and his life gets a little complicated when he finds the dead body of an old high school rival in the backseat of his minivan. As Deuce continues to battle the misconception that he is a stay at home dad because he’s lost his job/can’t find a job/leeching off his wife/lazy/incompetent/a little girly, he must now attempt to clear his name of wrong doing. In doing so, he runs up against devious PTA moms, a toupee-wearing Elvis lookalike and a midget private detective. (Yeah. I said midget.) Hilarity and hijinks and mystery solving ensue. Are you all sweaty with excitement now? You should be. Before you shower it all off, you can click over here to see what it looks like and decide where you want to purchase it. Seven years after Joe Tyler’s daughter Elizabeth was abducted, he hasn’t stopped looking for answers, and he hasn’t forgotten the friend who stood by him as he lost his wife, his home, and his career in his search. Now he’s been brought back to San Diego by the news that this friend has been arrested for beating up a teenage girl—a girl not much older than Elizabeth would be now. Joe is convinced Chuck Winslow is innocent, but Chuck is in a coma and can’t explain what happened. And the more Joe hears about what Chuck’s been up to in the years he’s been gone, the less Joe recognizes his old friend. To find out the truth, he will have to face his ex-wife, his former bosses, and a hometown full of wealth, lies, and illicit privilege. When Chuck’s accuser goes missing, Joe must decide where his loyalties truly lie. You can go here to get it. You’ll be hearing alot about both books in the coming days. I promise. Can NOT wait to read them both!! Best of luck to you in the upcoming year ! Very excited to read both. Love the Noah Braddock novels. 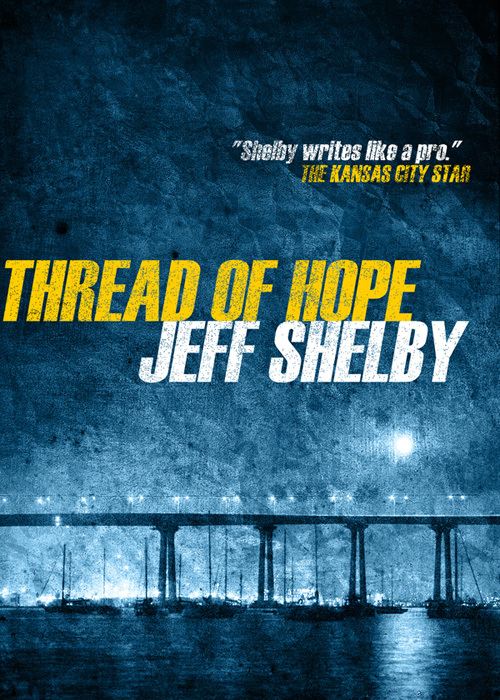 Really love the cover for Thread of Hope too–Coronado Bay Bridge looking south if I’m correct. Congratulations and here’s to a great 2012! Trina – you’re correct! And thanks! Already read STAY AT HOME. DEAD Very enjoyable. Look forward to more from Deuce, little Carly and little Victor. You have a way with character development. And the relationship between Deuce and his family is so easy to identify with. Even for a not stay at home dad. Looked for the new book, THREAD OF HOPE, on iBooks. Not there yet. Only on Kindle for now? Keep them coming please. I see Santa has been a little slow, oh well I’m sure we will all enjoy his presents! I have my copy of “Stay at Home Dead” ordered. Will “Thead of Hope” be available in any other eBook formats or just Kindle from Amazon? BTW, I just odered a copy “Liquid Smoke” in hardcover at the same time and I’m stoked!!! TWO NEW BOOKS! How exciting! This is perfect, I just finished reading a good book and was wondering what to read next.